Parsley is one of those magnificently overlooked and underappreciated herbs. Many people, conditioned to believe that it is purely for garnishing plates, don’t even give it a second glance. But parsley can absolutely hold its own with other exalted herbs, such as thyme, mint, and basil. In fact, it makes one heck of a pesto – which I’ve used here, swirled into a crusty bread. Unlike a pesto made from basil, which can taste almost sweet at times, a parsley pesto has an exuberant bite, one that demands a light hand, if you don’t like the flavor. Personally, I’ve developed a palate for fresh flat-leaf (aka Italian) parsley, having used it often as a major component in seafood dishes, and chopped as a garnish for just about everything else. I find a light dusting of fresh parsley will complement practically anything you like. It does have an assertive flavor, but one that melds beautifully with so many other seasonings and spices. The bread used here is not quite your standard white bread. It uses milk and olive oil to enrich the dough, and a bit of honey for the slightest sweetness. But the main difference here is the use of all-purpose flour, as opposed to bread flour. This is important, as all-purpose flour will produce less gluten than bread flour will. 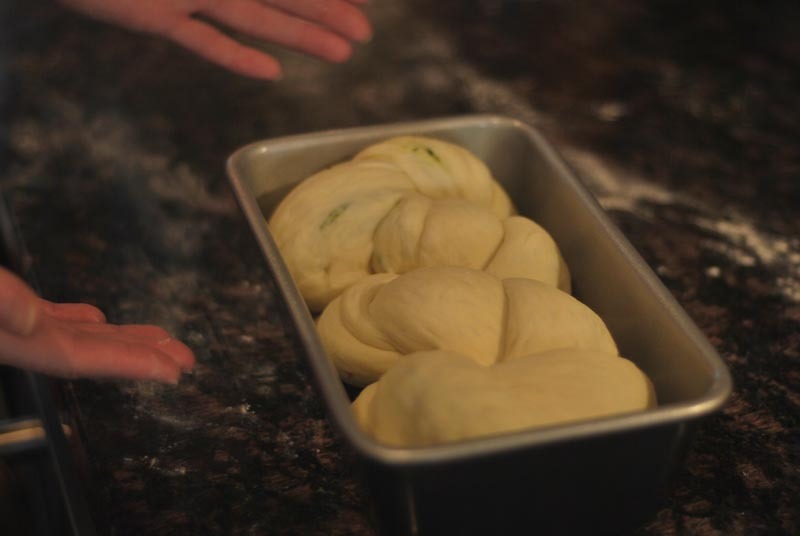 The dough is handled quite a bit, with the rolling out and twisting and all, so you need a flour that won’t get so easily overworked, and therefore tough. Speaking of the rolling and twisting, you may have seen this shaping technique before. 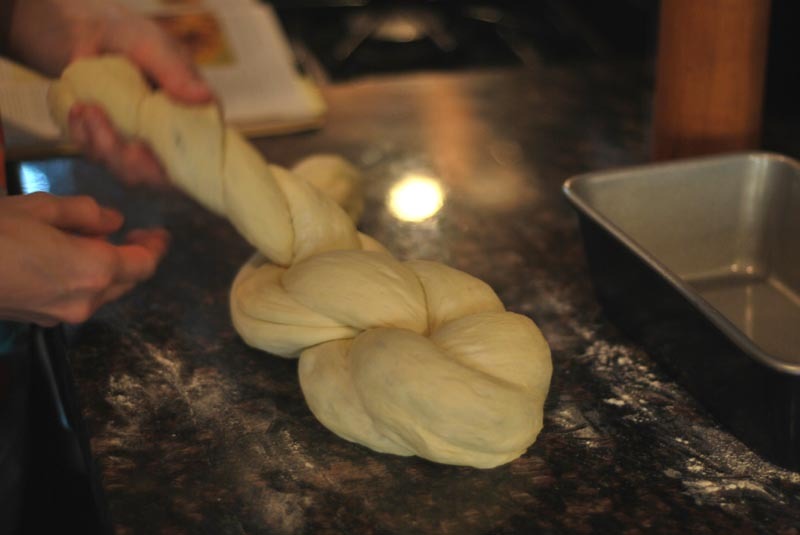 I’ve borrowed it from that wonderful and sweet Jewish bread, the babka. 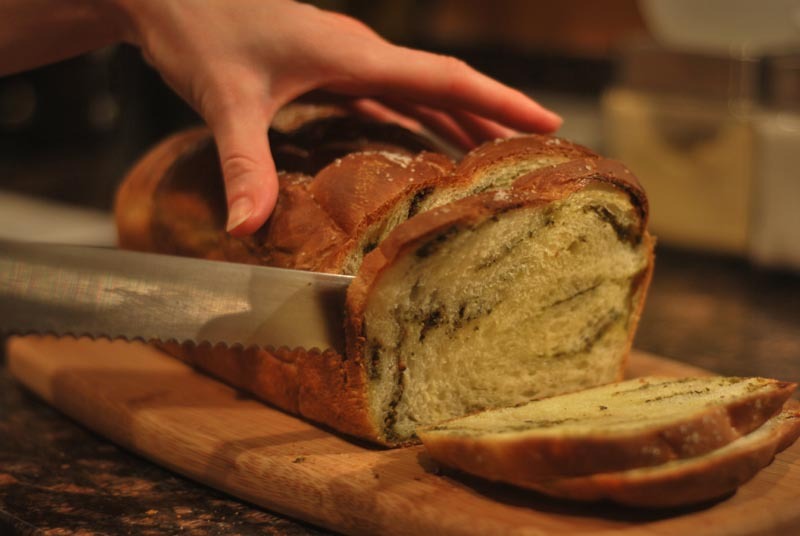 You can think of this as a savory babka if you insist, but the dough itself is far less rich than that confection (ignoring the obvious differences between this pesto filling, and the traditional cinnamon or chocolate babka filling). What you end up with here is a slightly rich bread, not at all over-the-top, but not exactly the standard non-fat artisan loaf either. The crust is pleasantly crispy, and the interior has a wonderfully light crumb. But the real treat is the swirling pattern of pesto writhing its way through the entirety of the bread, flavoring every bite with a pop of parsley, olive oil, pistachio, and pine nut. The elaborate shaping (detailed below in pictures) ensures that the delicious pesto is evenly distributed throughout each slice, neglecting not one inch. So if you’re one of those people who can only see parsley as that sorry little sprig on the side your main entrée, to be pushed aside and thrown away when done with the “edible” stuff, let me show you the error of your ways. Try this bread, and if you still hate parsley when you’re done, let me know. I’ll finish the loaf off for you by myself. 1. To make the dough, whisk together 14 ounces of the flour (setting aside the remaining 2 ounces), the salt, and the yeast, in the bowl of a stand mixer. Combine the the milk and water, add the olive oil and honey, and stir until the honey is melted. Add the milk mixture to the flour mixture in the mixer bowl. 2. Using the dough hook, mix at low speed until the dough comes together, scraping the bowl if necessary. Increase the speed to medium-low and knead until smooth and elastic, about 5 to 6 minutes, adding the reserved flour as needed to achieve the proper consistency. The dough should be a little slack, but not too wet, and should form a cohesive mass. It’s okay if it sticks to the bowl a bit. 3. Turn the dough out onto a lightly floured surface. 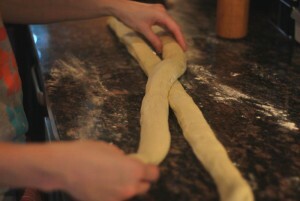 Knead a few times, until a skin forms around the outside of the dough. Pull the skin taught around the dough, forming a round ball. Transfer the dough to a lightly oiled bowl, turning to coat all sides with the oil. Cover tightly with plastic wrap, and let rise in a warm place until doubled in size, about 1 hour. 4. While the bread rises, make the pesto. Blend all ingredients together in a small food processor, and season to taste. The pesto should look a little drier and more crumbly than most pesto does. Place in a small container, cover, and set aside. 5. Butter or oil a 9 x 5 inch loaf pan. When the dough has fully risen, punch down, and turn out onto a lightly floured surface. Press the dough into a rectangular shape, and divide in half lengthwise. 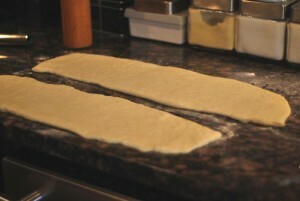 Roll each piece out to a 20 by 6 inch rectangle, or as big as the dough will allow. 6. Spread each half evenly with the pesto, leaving a half-inch border along the edge. 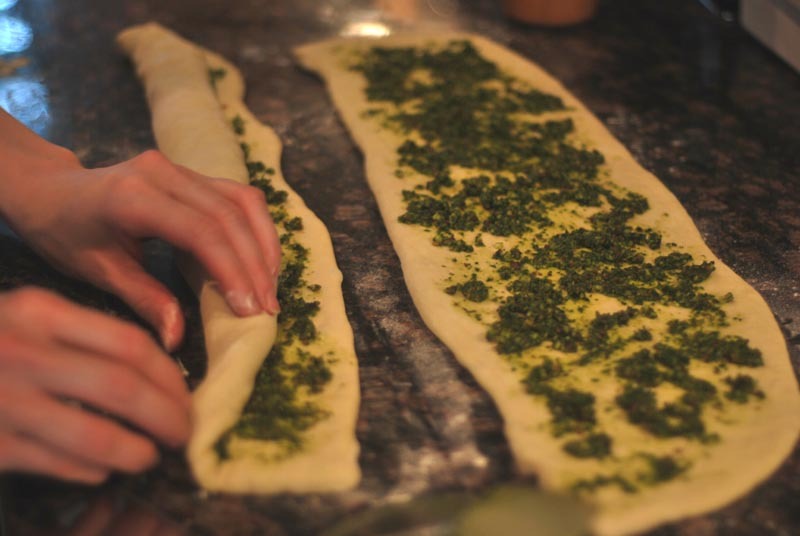 Fold the short edges of the dough just slightly over the pesto, to make a clean edge, and roll the dough up lengthwise (starting with a long edge). 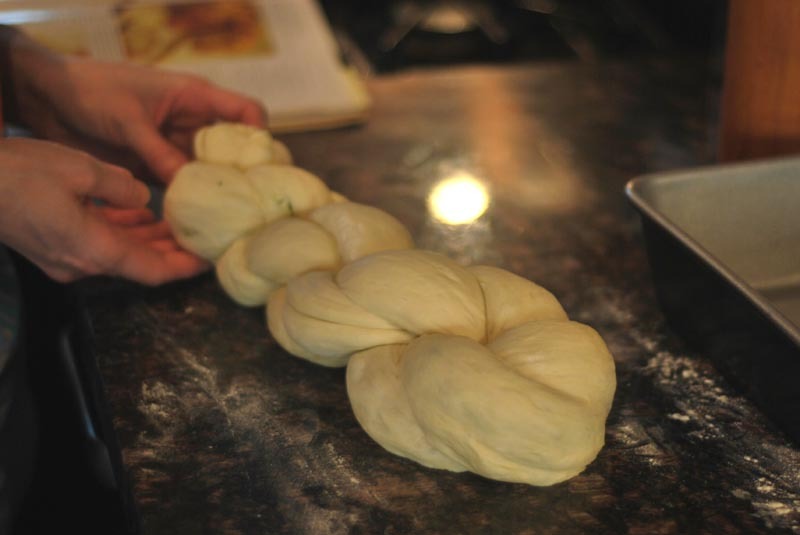 You may need to use a bench scraper to help with this, especially if the dough is sticking. Press the edge to seal. 7. 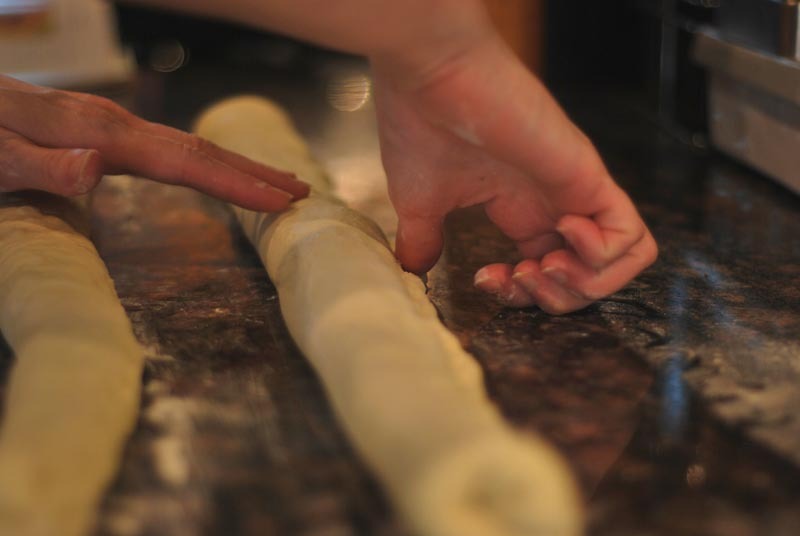 Lifting each piece carefully with floured hands, gently stretch each piece until it becomes about 30 inches long. The gluten should be relaxed enough to do this easily at this point. Cross one roll over the other. Continue crossing the dough pieces over each other, until you have fully twisted the two together. 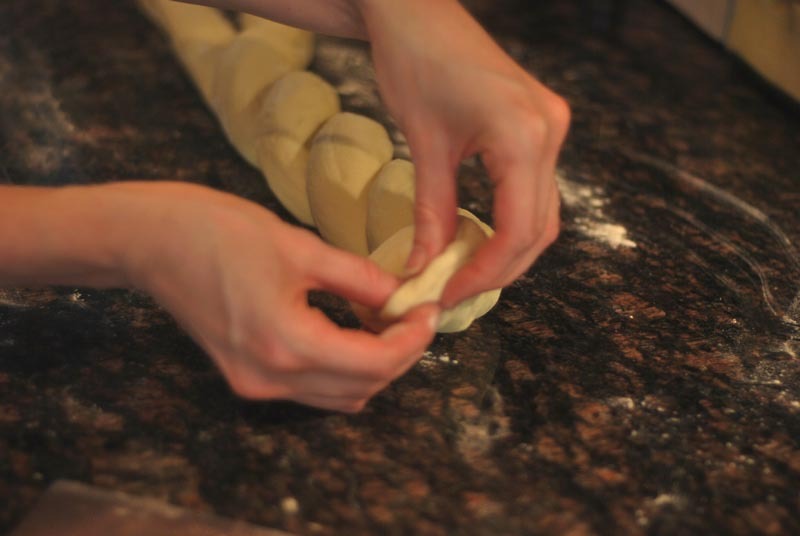 Pinch the ends of the dough to seal. 8. Bend the twist into a U-shape, so that the ends are next to each other on the counter. 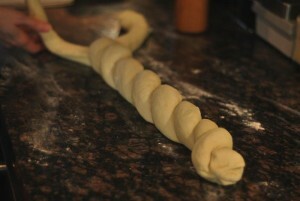 Twist the two arms of the “U” together, so that the dough is twisted on itself again. Pinch the end to seal. 9. Gently transfer the twisted dough to the prepared loaf pan, tucking the end under if necessary. Cover loosely with lightly-oiled plastic wrap, and let rise in a warm place until almost doubled in size, about 45 minutes. The dough is ready when pressed gently on the edge with a fingertip, the depression fills in very slowly. Preheat the oven to 425° F.
10. Uncover the dough. Drizzle or carefully brush the risen loaf with olive oil, taking care not to deflate it. Sprinkle kosher salt evenly over the top. Bake the loaf at 425º F for about 30 minutes, or until nicely browned, and an instant-read thermometer registers 200º F when inserted into the center. Remove from pan, and let cool at least 1 hour on a wire rack before cutting. 1. This bread needs to cool for at least 1 hour before slicing, as the added steam from the pesto needs to fully disperse into the interior of the bread. If sliced too soon, the crumb will not yet be fully set, and the decorative swirl inside will be ruined. 2. Okay, sure; you could buy pesto for this. But I designed this pesto specifically to be a bit dry; most store-bought pestos are quite oily. That extra oil and moisture would be a detriment to the texture of the bread in this case. 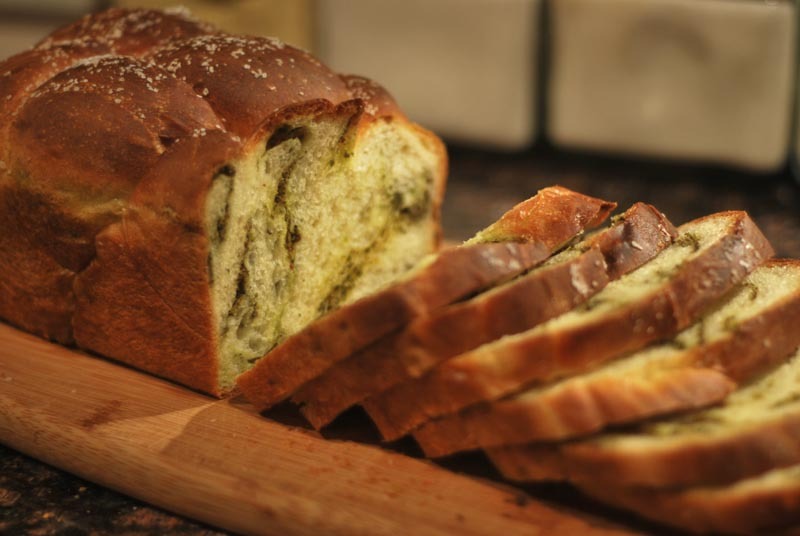 If you baked a loaf plain, then spread the pesto on a slice afterwards, that would be a different story. In this case, however, where the pesto is actually baked into the bread, it is more beneficial to keep the moisture level down.